Cabinetry: Centra/Mouser Inset cabinetry with Fairmont Doors and Winchester Drawers with cushion close features. Countertops: Perimeter, Island and Wine area in Golden Beach Granite with an Ogee Edge. Now this is a kitchen that will always be in style! 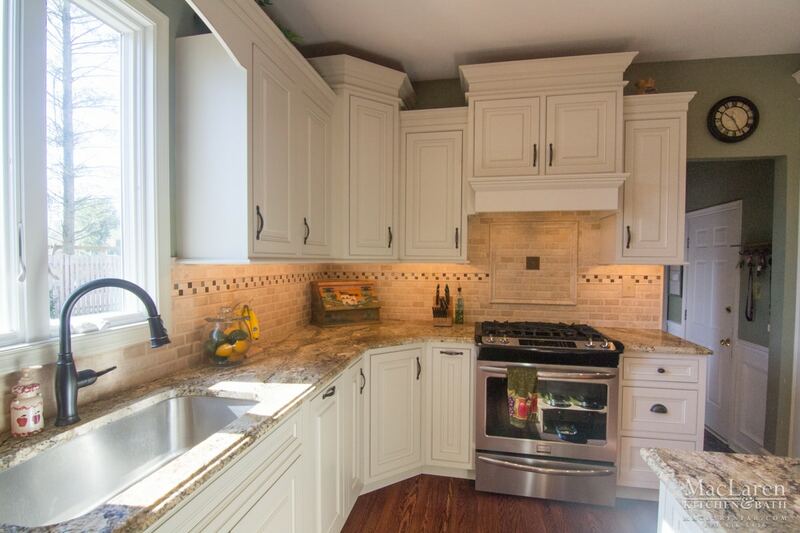 This beautiful West Chester, PA classic kitchen was designed by our experienced designer Michele Hennessy. Take a look at how our team at MacLaren Kitchen and Bath created it below! This kitchen features beautiful white custom Centra/Mouser inset cabinetry in the Fairmont door style, with Winchester drawers. 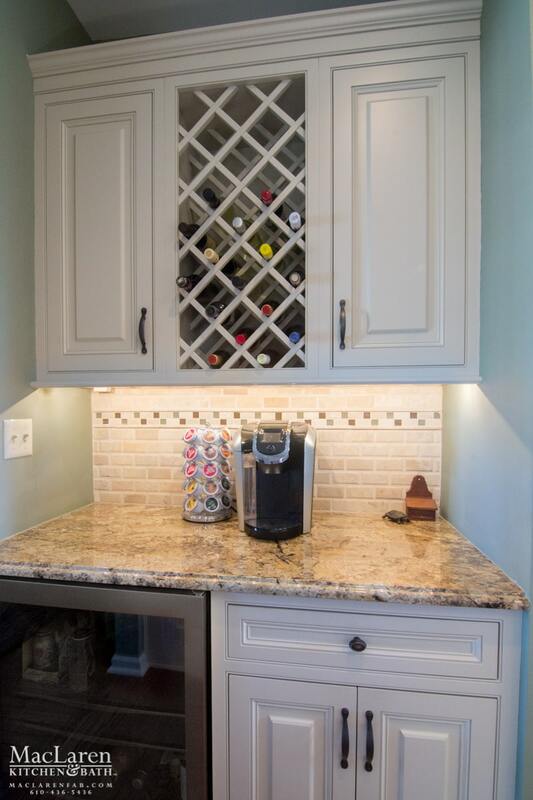 Take a look at that gorgeous glass inset wine bar cabinet! The little details in this kitchen really make it shine. This kitchen shows you don’t have to pack your kitchen full of the latest trends to create the perfect space; just follow your style to your perfect kitchen. 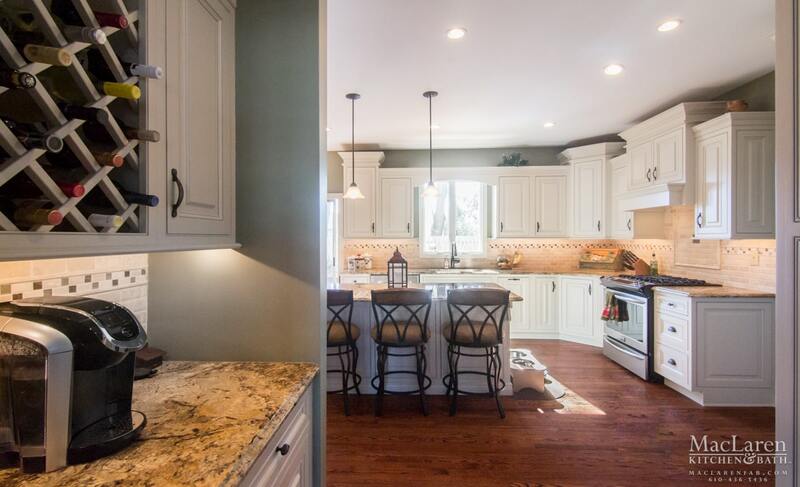 The lovely Golden Beach granite countertops with a stylish Ogee edge on the perimeter and island in this classic kitchen set a warm, inviting tone, and the rosy, backlit backsplash creates an intimate feeling. The edging of countertops does have an impact, and these Ogee edges say stylish! This is a kitchen family and guests won’t want to leave. Bonus features of this kitchen include a dry bar niche and a spacious walk-through pantry area for the ultimate convenience and entertainment potential! It’s easy to imagine entertaining with a kitchen like this. If you have a piece of a kitchen hallway you’re not using, consider making use of it by turning it into a walk-through pantry like this one, or adding extra storage and cabinets. Extra kitchen space can also be home to floating shelves or artwork. For a classic kitchen, think of neutral, soft colors that bring people in and matte fixtures that blend in with the kitchen. Classic doesn’t have to mean old-looking or ornate, it’s easy to create a timeless kitchen in a contemporary, streamlined style that will be valuable and timeless for years to come. If you haven’t quite found your classic style in pictures or catalogs yet but this classic kitchen speaks to you, MacLaren Kitchen and Bath can create custom cabinets like the ones in this West Chester, PA kitchen to really put the icing on the cake, so to speak, or build around other details you love in this kitchen to really make the classic style your own. 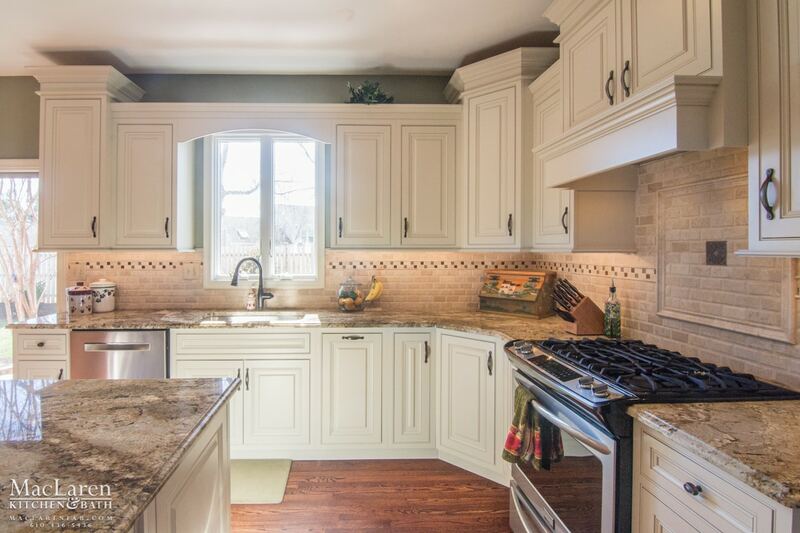 If you’re looking for a classic kitchen for your home, MacLaren Kitchen and Bath can make it happen! 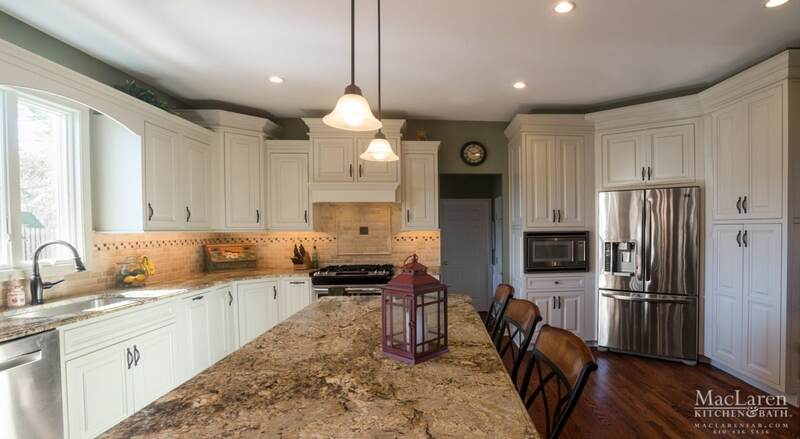 Located in West Chester, PA, we have been experts in kitchen and bath remodeling for over 30 years, and we have many happy customers in the West Chester, PA area, including the owner of this kitchen. After your free consultation with us where we determine materials and budget, we will listen to your ideas and turn them into a design for the space you’re working with. After that, we’ll show them to you and make sure you’re a part of every step of the remodeling process and create a job binder for your project that includes the designs and materials ordered for your new kitchen! We offer same day removal and remodeling to make the process as easy as possible for you. If you’re thinking classic but unique, don’t forget that we have a wide range of materials and custom options for cabinets, backsplashes, countertops, islands, and more! Head over to our showroom in West Chester, PA for ideas on how to make your classic kitchen dreams reality, or give us a call to get your free quote from Maclaren Kitchen and Bath at 610-436-5436 today. We hope to see you in!